Honouring Nikki Haley with the 2019 King David Award. 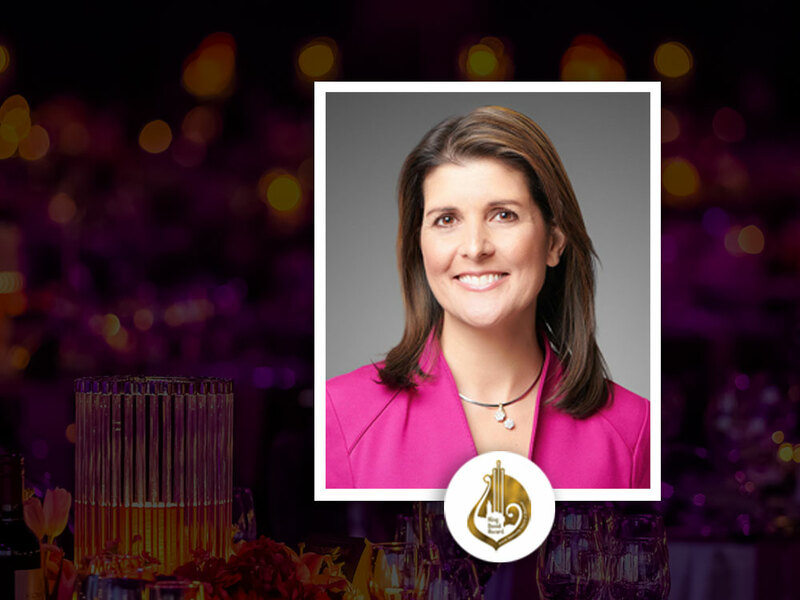 The Jewish Community Council of Montreal is pleased to announce the presentation of the King David Award to the former United States ambassador to the United Nations, Ms. Nikki Haley. The King David Award Gala, to be held this year on April 10, 2019, is an event designed to be embraced by the entire Montreal Jewish community. Bringing together Jews from throughout the city and beyond, it is an evening for reflection and for gratitude toward those outside of our people who have proven themselves to be true friends to the Jewish nation. The King David Awardees, the first of whom was then Prime Minister Stephen Harper, are chosen for their courage, strength, intelligence and faithfulness in promoting a just world and standing up in defense of Israel and Human Rights. Nikki Haley is an exemplary example of just such an individual. She is most prominently known throughout the Jewish community for repeatedly taking a strong and principled stand against the chronic anti-Israel bias at the United Nations. In the UN Security Council, she proudly issued the first American veto in six years defending the United States’ sovereign right to move its embassy to Jerusalem — Israel’s true capital. Throughout Ms. Haley’s term at the United Nations, she was a champion of human rights, challenging oppressive regimes across the globe and travelling around the world to better understand the needs of refugees and displaced persons. Additionally, Ms. Haley worked tirelessly to streamline the United Nations’s bureaucracy and make it more efficient, transparent, and accountable. Prior to her appointment as Permanent Representative of the United States of America to the United Nations, Ms. Haley, a native of Bramberg, South Carolina, was twice elected to swerve as the first female Governor of he native state. As governor., Haley earned a reputation for her economic and educational reform policies. In addition to her political activities, Ms. Haler is the mother of Rena, 20 and Nalin, 17, and the wife of Captain Michael Haley. Nikki Haley had the courage to stand up for her convictions and the strength to withstand the reaction of those who opposed her support of Israel. Her recognition of the unique nature of the Jewish people’s national homeland will mark her forever as a heroine. We hope that you will be able to join us in presenting her with the 2019 King David Award.